If one sees a picture of the Pittsburgh city skyline, most likely it was taken at this small parklet that was once a Native American lookout, but has now turned into just an incredible vista for urban photographers. Elliott’s Bluff commands a wide view where the Allegheny and Monongahela Rivers meet to form the Ohio River. Known locally as The Point, the raised look out point lies at the edge of Pittsburgh’s downtown area. Before the city became an urban manufacturing hub, local Shawnee and other Native American tribes would survey their settlements from the top of the peak. Locals have long reported finding arrowheads on the site. Today, the Pittsburgh neighborhood of Elliott is on top of the bluff and the prime view of the skyline is part of a modern park, West End-Elliott Overlook Park, more commonly known as the West End Overlook, having been renovated in 2003. Before that, it was a simple turnaround that just happened to have a great view. Now, landscaped gardens, benches, and a pavilion provide a more welcoming atmosphere to take in the view, catering to all of the amateur photographers that visit the spoke during the golden hour of the day. 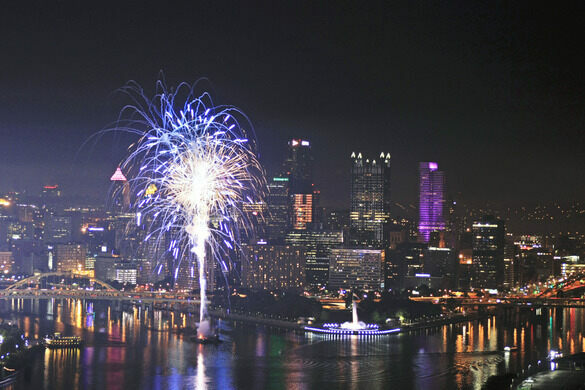 The elevated viewing point is also a popular place to catch fireworks and other outdoor events in the Steel City. Not bad for an area known for its industrial heritage.